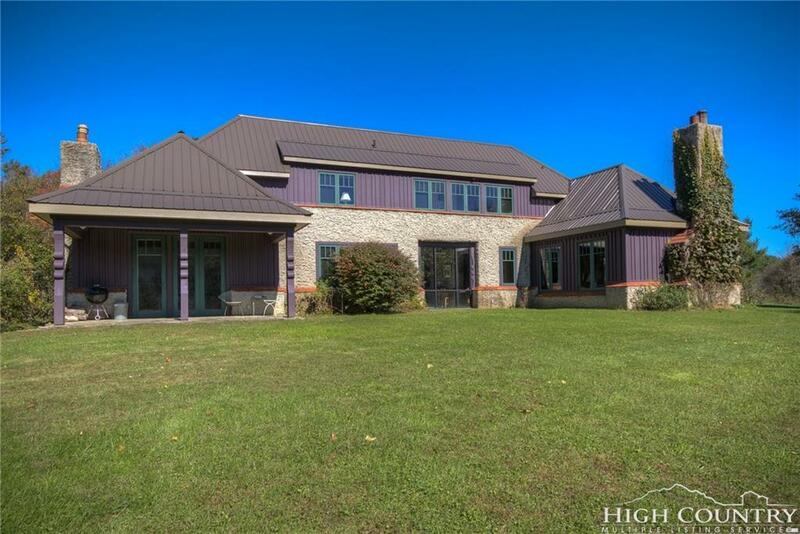 One of a kind architecturally-designed manor perched on a 6 acre knoll close to the New River. The details and craftsmanship of this house will impress the most discerning buyer. The siding is board and batten with craftsman-style spatterdash stucco. As you enter the gracious glass foyer, the living room, kitchen and dining room are to your left. Open and bright, the entire space is filled with windows over looking the yard and patio. The custom built kitchen is a chefs dream with plenty of counter and storage space. Just off the dining area is an outdoor patio with perennial flowers and plants. To the right of the foyer, you will find a large office that connects to the master suite. Cathedral ceilings and a fireplace mantle made from a tree cut from the property,a covered back porch and attached bath complete this very special owners retreat. Upstairs you'll find a wall of windows in connecting the two bedrooms with a shared hall bath.There is room for an additional bath to create 2 suites, if desired. The lower level garage provides more storage for lawn and outdoor equipment. Meticulously maintained inside and out with new roof and exterior paint in 2018.